In addition to the Jerry Brown Arts Festival, the Northwest Alabama Arts Council’s continued progress and development is demonstrated in its involvement in arts-related community programs within Marion County. The Northwest Alabama Arts Council promotes artistic skills development and education of members of our council and our community. In June 2010, the arts council in conjunction with the Hamilton Area Chamber of Commerce cosponsored a two-day Photography Improvement Seminar under the direction of 30-year retired Kodak employee John Dersham. As a result of the success and popularity of these photography seminars, the Image Masters Photo & Film club was formed. Please see the Image Masters page on this web site. Additionally, seminars/classes in painting, pottery, and other art forms are offered at various times throughout the year. Shown below are photographs taken at the June 2010 seminar. 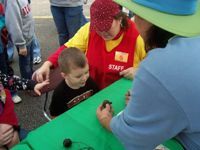 Each year the Hamilton Area Chamber of Commerce sponsors the Buttahatchee River Fall Fest (BRFF) on the last Saturday in October in beautiful downtown Hamilton. 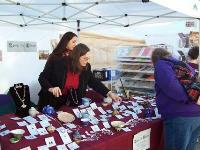 In 2008, the NWAAC was approached by chamber leaders to start a "stand alone" arts and crafts section at the festival. Very diverse in nature from the Jerry Brown Arts Festival, the BRFF is not juried and is an outdoor event, and it allows for admission into the section of craftsmen and craftswomen, the basic requirements being some portion of the items sold in the booth being handmade and being in good taste. The agreement between the two organizations mandates all proceeds from the arts and crafts section be donated by the NWAAC to art education programs in the three Hamilton schools – Hamilton Elementary, Hamilton Middle, and Hamilton High School. Proceeds from past festivals have supported HES’ annual spring play, HMS’ Art in the Middle program, and HHS’ band and choral programs.